Navigate to Layout >> Page Elements and see if you are having a Label widget (a widget to show labels) there. If you are not having a label widget already, click on Page Elements >> Add a Gadget >> Labels and Save it. If you are already having a Label widget, read the next step. Navigate to Edit Html and expand your template by clicking on Expand Widget Templates. Now scroll down for the following piece of code. When you find this code, Delete it. Now save your template. You are done. 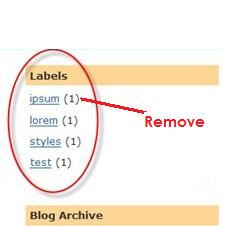 This blogger trick will hide and remove your blogger post label counts from the sidebar. From now on your visitors will see the labels only, the label numbers are gone forever!